August 10-12 for the 5th Year Copper Mountain will be hosting Guitar Town and for the 4th year the acclaimed Art Guitar Silent Auction returns to Guitar Town. The Art Guitar Silent Auction features a unique Collection of guitars crafted, painted, and designed by Colorado artists. On July 27th, 6-9 P.M. catch a sneak preview of Guitar Town and 20 new Art Guitars at Kanon Collective 766 Santa Fe Dr. Denver, CO 80204. For this one night only event guests will have the chance to preview 20 new art guitars and be the fist to place a bid on these great pieces of art. 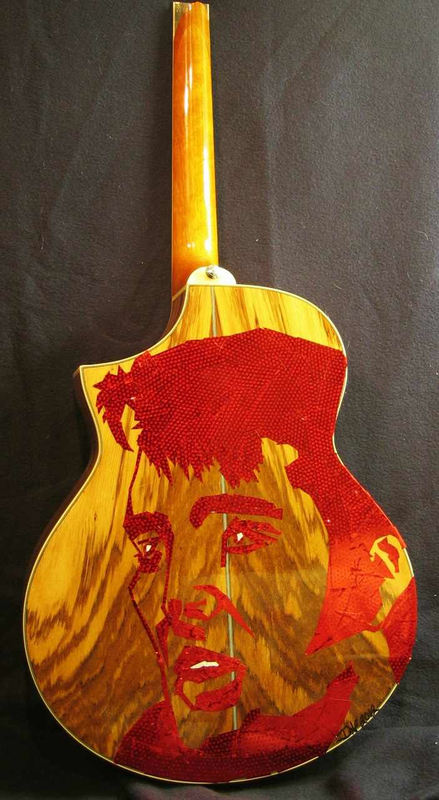 These Art Guitars are created from damaged guitars, kindly donated by the Guitar Center of Denver. Proceeds from the Art Guitar Silent Auction go to benefit MusicCares. MusiCares provides a safety net of critical assistance for music people in times of need. MusiCares’ services and resources cover a wide range of financial, medical and personal emergencies, and each case is treated with integrity and confidentiality. MusiCares also focuses the resources and attention of the music industry on human service issues that directly impact the health and welfare of the music community. This night guest will also get a chance to preview some of the musical talent of Guitar Town. One of Guitar Town’s featured performers, Jazz Guitarist Sean McGowan will play a intimate set in Kanon Collective’s Court Yard. P.S. If you miss this one night show but would like to check out these Art Guitars before they head up to Copper Mountain Guitar Town. They will be on display at Guitar Center1585 S. Colorado Boulevard, Denver, CO (303) 759-9100 ‎from July 29th through August 5th. There several more guitars waiting to be photographed and this enrty will be updated as I get the photos. Also, look for an interview or some other content regarding Eric Matelski (the art pimp) in future entries!